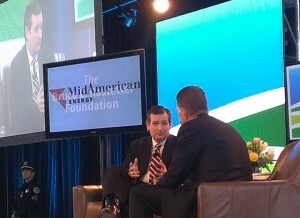 Taking the stage with Iowa ag businessman Bruce Rastetter, U.S. Sen. Ted Cruz of Texas, a likely Republican presidential candidate, was immediately asked about the “elephant in the room,” his steadfast opposition to the Renewable Fuel Standard and the wind energy Production Tax Credit. He handled those questions well, and received the most applause of any candidate who took the stage throughout the first half of the event. “I know there are a lot of people here who would like me to come in and tell you I’m all for the RFS,” he said in response to Rastetter’s opening question. Asked about how ethanol can continue to gain market access without the RFS, Cruz said it’s less of a challenge today because the ethanol industry is well established. “I have every faith that businesses can continue to do well without having to go to Washington on bended knee asking for subsidies,” he said. Cruz also tackled the issue of immigration, saying he is, “both optimistic and pessimistic, which may be a sign I’ve been in Washignton too long.” He said the U.S. needs to get serious about securing the borders and stopping the problem of illegal immigration. by improving and streamlining legal immigration. He also referenced his father’s own immigration story, coming to the U.S. from Cuba when he was 18 years old. He then took a question about genetically modified organisms in food production, saying he was not opposed to their use, and that a free market solution exists whereby consumers can purchase organic foods. He said efforts to ban and label GMOs was the product of “radical left” ideology. Cruz also used his 20 minutes with Rastetter to attack Waters of the U.S. regulations and ObamaCare. He also took one more shot at his colleagues in the nation’s capital. “I’m willing to bet I’m not the only person here, who has been disappointed with politicians in Washington,” he said. Applause followed.